Remodels are an important part of any restaurant owner’s long term business plan. At MRP Design Group we have been part of several remodel initiatives including: Taco Bell, Popeyes, Zaxby’s, Dunkin’ Donuts and now Wendy’s. 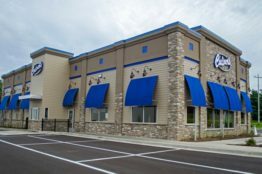 The updates included in Wendy’s remodel plan are a far cry from their previous style including a fresher, modern exterior, updated seating and digital menus. When you visit a remodeled Wendy’s don’t be surprised to find a lounge area complete with a fireplace, large-screen TV and comfortable, padded chairs. With a goal to increase their average unit volumes to 2 million, the remodel component of Wendy’s “Image Activation” program is critical to helping the chain achieve this target. As of May 2014, CFO Todd Penegor indicated these remodels on average have generated sales lifts upwards of 20 percent. The company’s goal is to remodel 85 percent of company owned units by 2017, and 35 percent of franchise owned units.